Roasted acorn squash with sauteed leeks topped with pepitas and chopped chives. 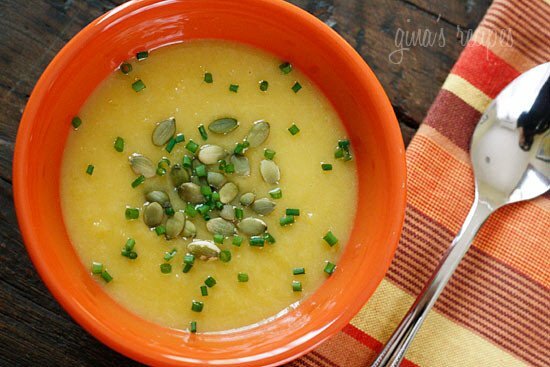 Leeks are reminiscent of shallots but sweeter and more subtle, a perfect compliment to winter squash. 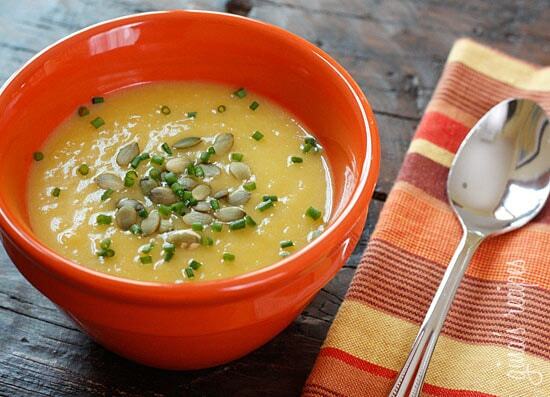 If you like Potato Leek Soup, I think you will love this soup. 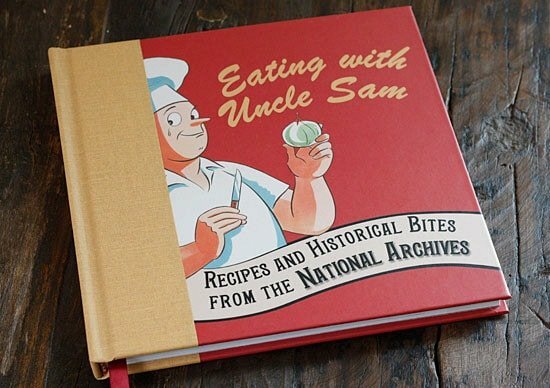 While in DC, I bought a few cookbooks to give away from the National Archives. This recipe was modified this recipe from the cookbook, Eating with Uncle Sam: Recipes and Historical Bites from the National Archives. 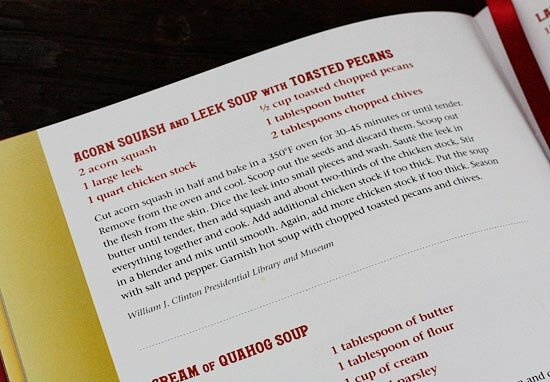 The original recipe was from the William J. Clinton Presidential Library and Museum. My intention was to follow the recipe exactly as written, which was served with toasted pecans, but as I started cooking, I realized I was all out, so I used pepitas instead, chopped walnuts or hazelnuts would work too. Loaded with recipes from American History including Michelle Obama’s favorite turkey lasagna, John F. Kennedy’s fish chowder, Queen Elizabeth’s II’s scones and more, with an introduction by America’s 2011 Outstanding Chef of the Year, José Andrés. 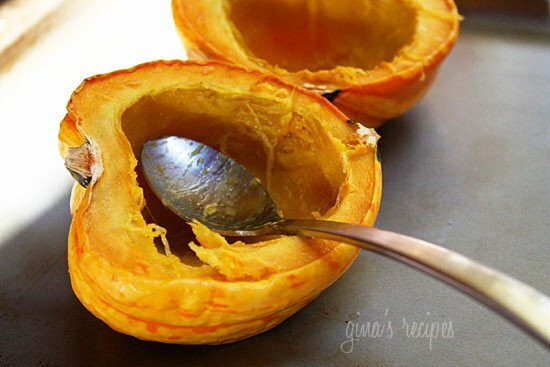 Cut acorn squash in half and bake until tender, about 40 – 45 minutes. Remove from the oven. Meanwhile, discard dark green part of the leek. Leeks usually tend to be sandy, so I like to clean them well by separating the layers and washing them well under cold water. Chop leeks and sauté in a large pot with butter or oil over medium low heat until tender, about 5 minutes. 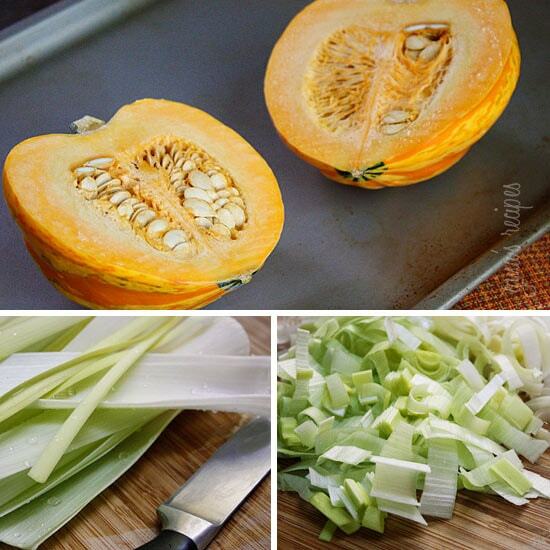 When squash is cool enough to handle, scoop out seeds and discard. 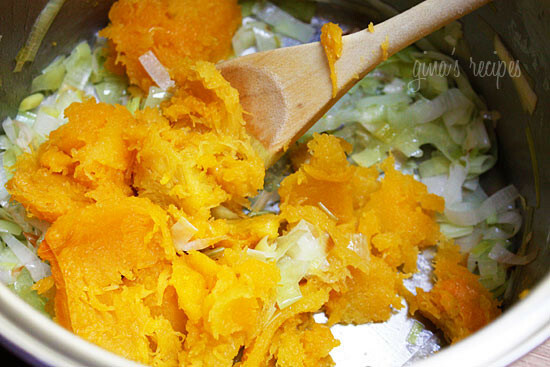 Scoop out the flesh from the skin and add to the pot with leeks. Add about 2/3 of the chicken stock to the pot; stir well and simmer about 5 minutes. 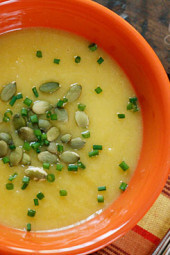 Using an immersion blender or a regular blender, blend soup until smooth. Add remaining broth and simmer a few more minutes. Adjust salt and pepper to taste. Garnish with pepitas and chopped chives.